Advanced anti-ageing moisturiser for dry skin smooths fine lines and wrinkles. Our most advanced anti-ageing formula for dry skin. This skin reviving moisturiser is infused with retinol and contains a potent mix of antioxidants to strengthen skin and promote younger-looking, firmer skin. The hydrating, creamy formula provides long-lasting moisture for softer, smoother more radiant skin. This product is great - I was looking for a night moisturiser with retinol that was not too heavy as I suffer from acne. It is moisturising without clogging up my skin and sinks in really well. If you had very dry skin, it might not be rich enough. 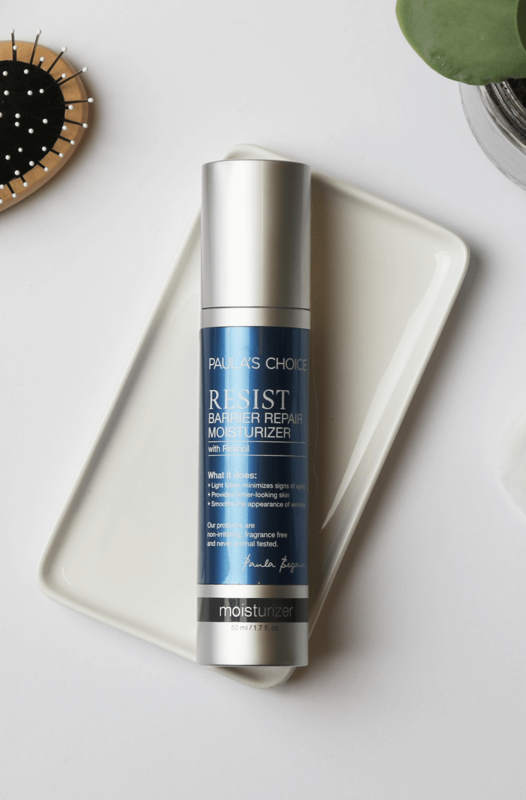 The Resist Barrier Repair Moisturiser is a firm favourite in my routine. I use it at night after a serum and my skin is so soft and smooth in the morning. I have recommended it to many of my friends! There is something in this that made my skin absolutely melt down - within just a couple days it had erupted into very angry spots that took months to settle down. I'm sure it's a great product for someone else, but my skin just did not cope with it well. Customer Care: Hello Sunday, thank you for sharing your experience with us. We're sorry to hear this didn't work as expected for you! Please contact a member of our Customer Care team, who can assist you with a possible alternative. I was recommended the Resist Barrier Repair moisturiser by my Physiotherapist. She has been using Paula's products for a couple of years and is very happy with them. I was sceptical. I have dry patches on my face, sun damage and 'normal' patches too. I decided to give it a try along with the retinol repair oil and I am very pleased at the results, within a month I could clearly see improvement to the dry patches and even the sun damage shows much less. I will continue to use and now recommend these products. It is an excellent product. I have been using it for over an year and I am very pleased with it. IDM - One year and still going strong! I have been using this product for over a year now and wouldn't change it! While wrinkles aren't my main concern, I use retinol products to combat breakouts and this product is a great solution for my combination skin. It is not too thick or oily (like most creams tend to be for dryer skin), it goes on smoothly and is absorbed quickly making my face feel soft, smooth and refreshed. I use this in combination with Hylaronic Acid booster which is essential for Retinol based products to increase absorption and moisture. Excellent for my combination skin. I've been using it for a few weeks and my skin looks and feels smooth and hydrated and it hasn't caused any breakouts. Definitely a keeper! Amazing product, must try. Great texture, absorbs easily and skin looks less pigmentated, softer and brigther. Might not be suitable for extra sensitive areas, but worth it as an overall daily treatment. Amanda - No doubts now! So, I decided to give this another go and ordered the full-size product this time round. Let me set the scene, I found the Resist daytime moisturisers, SPF25 and SPF50, too heavy for daytime, found this product to light for nighttime, so using this as my *daytime moisturiser became the perfect compromise! Although the PC customer service (hey there fabulous people!) give excellent advice, especially when you first start using any of these products, you do have to tweak the routine to suit your own skin and situation, as well as persevere with some of the products. I am perfectly happy using this daytime and it sits well over the Resist 2% BHA refining exfoliator and the Resist ultra light antioxidant, making an excellent base for makeup. In addition, this product contributes to the retinol effect! Customer Care: Thank you for your review and your compliment. We are very happy to hear that you've found the best way to use this product along with the others that work best for you. I bought the trial size of this product and again, as with all the trial sizes, it lasted ages! I'm guessing over 3 weeks with evening use only. I didn't dislike the product and yes, I guess, I did like it but I suspect that it's not going to be moisturising enough for me, going forward. Instead I have ordered the intensive repair cream as I use the weekly resurfacing AHA treatment and plan on trying the 1% retinol product again, so dry, peeling skin is a possibility hence needing a more hefty night time product. This is by no means a negative review, rather this product didn't sing and dance as much as the products I liked and I think it won't be enough for my upcoming requirements. Louise - Lovely, but can't use! This is my favourite PC moisturiser along with the intensive version. Unfortunately, my eyes can't tolerate it. They water and sting all day. It's perfect for my normal /combo skin though, really light, yet comfortably moisturising. I've given it 5 stars still as the problem is not with the product, but with the sensitivity of my eyes. I think though there is a bit of a gap in the PC moisturisers for people who have normal skin that can be a little combo or a little dry. I think this should be available without retinol too for those who would like to use a product like this this during the day and to use retinol at night instead. I shall try the new calm moisturisers next and see if my eyes are OK with one of those. A real shame I can't use this. I started off with sample size of this, which lasted quite a while. I was really impressed with it and ordered full size one.However the more I have used it the more my skin is drying out.I have tried the resist serum under it,and Paula's choice make up over it. I am new to Paula's choice and have spent a lot on various products and samples( including a couple bought from the US. )But at the moment all this experimenting has just left me poorer and my skin worse. But I do love the products,just that I'm not getting very far! Some advice regarding this product..if you are put off by a pump ,buy the men's night moisturiser in the tube,which is the same product and ( if it works for you) you can extract every last bit. Customer Care: Thank you for your review. It may be that this product is not the most suitable for your skin type. You are welcome to contact us for further skincare advice. Honestly....buy it! Best moisturiser for night and day (though use a sunscreen). It sits well under most foundation, non oily and does what it claims. However if you happen to get a super dry skin during the depth of winter, I suggest adding some oil to this to boast the moisture. Quite good consistency, slim air tight bottle. At first, seemed a little too light for an evening treatment but perhaps good for hot summer nights (less sticky on skin). Also, if using it during the day, then good that it's 'light' because it could be followed up with a layer of SPF 50 Sun lotion. I received a small 30ml of this moituriser as a free gift with my first order - and I liked it. I was hesitant at first, my combination, break out prone skin, HATES moisturisers of any kind, usually pushing them back out of my skin to sit like an oil slick. But this product suprised me. It was quite a thick, yellowish liquid/cream which glided onto my skin and was absorbed very quickly. One pump was plenty to cover my face. It stayed in my skin, and didn't create oiliness, irritation or breakouts. I was initally using it as my nightime moisturiser as it has no SPF, but to be honest, my skin doesn't actually NEED it, the cleansing, toning, exfoliating, serum routine seems to be enough. But I do like to use it around my eyes at night - as an eye cream. It feels very moisturising on that area and sinks in nicely, no greasy afterfeel or irritation despite the retinol. This is a NICE product - though not one I will personally buy after my free trial size is finished - but that's purely because my skin just doesn't need it. This product is wonderful! After purchasing many different makes of retinol creams in the past and them all making my skin flaky, red and sore after just a few days, this product just makes my skin feel and look fantastic. It has a wonderful light creamy texture which soaks into the skin quickly and you can apply make-up straight away as there is no greasy texture left on your skin. I originally bought this just to use at night and with my previous experiences of creams with retinol was a bit hesitant to use it in the morning as well but now I use it every morning alone and on alternate nights after using Resist Intensive Retinol Serum and I have never been happier with the way my skin looks and feels. Best moisturiser I've ever used by a long way. I like this. I find it quite light and it doesn't leave my chin dry or my forehead greasy. Even though the texture of this feels creamy, everywhere on my face seems to enjoy it, from the dry patches on my cheeks to my oily skin. I only use it every few days as I want my skin to get used to the retinol - but I'll definitely be buying the full size version when my trial pump runs out. I would only use this at night as it doesn't contain an spf, but its particularly good on my décolletage and neck, where I've been sun damaged. I have combination skin and the lightweight texture of this moisturiser is amazing. It absorbes well into my skin without it feeling sticky or tacky, I use it as my night time moisturiser and it's amazing. I sometimes mix it with the clinical retinol 1% which feels really good on my skin as well. I'm tempted to order a backup of this product. One 1.8ml sample lasted two uses (face and neck or decollette) so am applying more retinol with this than a serum. This is very light, yet hydrated my skin reasonably well when it felt a little tight after using an AHA product. I haven't experienced any irritation or adverse reaction even used twice a day or on irritated skin after microneedling. Not holy grail for me but appreciate that it is not loaded with silicones. It's obvious from the ingredients list that a lot of thought went into this product, the well researched components and even the airless pump system. The pump can be tempermental at first, but after a few uses it sort of settles down so you don't have to slowly pump a few times to get it going again. However, my skin is especially fussy about moisturisers as they're the last step and it didn't like this one. It doesn't break me out directly but contributes to it, it sits on the surface of my skin (one pump used, so a very small amount) and refuses to absorb. So I end up feeling sticky/tacky and just uncomfortable in general. Kelly - really bad packaging. Just got this moisturizer today and the pump not working? Wish paula's choice would sort out better packaging. payed for an expensive product that is unusable. Customer Care: We are sorry to hear about the pump. This product is packaged in an airless pump dispenser which utilizes a vacuum system to dispense and keep the contents fresh. Airless packaging helps to keep air and contaminates out of the product, which enhances the formula's stability and effectiveness. I've loved this moisturiser since I first used it. Everything was great until the pump was changed. I couldn't get enough product out of the pump at one time, and it doesn't recover at all quickly. It kept getting worse until I had to just discard the rest of the moisturiser. I'm quite upset since the product, itself, is the best ever. Please bring back the old pump or fix the problem so I can use this product again. Customer Care: Thank you for your review. We are sorry to hear about the malfunctioning pump. Sometimes when you start to use this product you have to pump several times before the (airless) pump starts working. If the problem cannot be solved, please contact us again so we can offer an appropriate solution. I have quite tricky skin, oily but with rosacea, and have found I can't tolerate BHA anymore. However, even though conventional skincare experts advise against retinol, I find this leaves my skin calmer and softer than ordinary moisturizer. I use it at night and it seems to help with redness and flaking. It leaves skin looking fresher and fine lines around my eyes seem diminished. I always follow in the morning with a moisturizer or foundation with a good SPF. sue - Good, but don't go crazy with it! This is a beautifully silky moisturiser that just sinks in but leaves a healthy dewy sheen. So, I got trigger happy and started pumping it out every 10 minutes. But more is not more. My skin reacted so badly - burning and redness. Lesson is - use sparingly and enjoy! This moisturizer is a must-have for anyone whose main concern is anti-aging. This silky gel-cream works wonders for the skin! After using it, my skin is so soft and as I've used it over a prolonged period of time, my skin is firmer also. I love that this moisturizer has Retinol in it as well: a huge bonus! If you have oily skin do not worry about this moisturizer exacerbating any oil problems you may have. It sets to a wonderful matte finish and isn't overly emollient which leads me to thinking that if you have drier skin, it may not be moisturizing enough for you. The only downside to this product is the dreadful packaging it comes in. The pump is terrible! After three weeks of usage, the pump stopped springing all the way up after being pressed down and I kept having to bang it on a hard surface to get the product to dispense. Please fix this! This is a great lotion that works for my dry, sensitive and aging skin. skin feels smooth. My sister says my skin looks more radiant than before. Anne-Ce - The best moisturizer ! That's the best moisturizer I have ever bought. When my daughter developped some acne I decided to buy Paula's book ( I had kept an article about the book just in case one day ...). I solved my daughter's problem and had the same time found this fantastic cream after sampled a few others. No itching, the skin doesn't feel greasy. The only problem is that it doesnt last as long as the other Paula's Choice's products. Thank you Paula for your work. I wished I had discovered the book sooner. Karen - Good product - shame about the packaging! I am very happy to say this product works beautifully on my 50 year old but sadly still blemish-prone skin. I am also pleased to see from another review that the problems with the pump have been resolved as mine did not work properly from day one! I realise that the opaque packaging is to keep the ingredients stable (which is obviously very important) but it makes it absolutely impossible to see how much product you have left and you don't know when to buy more until it runs out. Other than that, I am very pleased and will continue to use it along with many of Paula's other products. Josh - A Holy Grail product for me! I'm on my 4th bottle of this now and absolutely love it! It has a really nice finish, is not greasy at all and doesn't irritate my skin in the slightest, even around my eyes! It's not overly moisturising though, so those with drier skins may well need to use another moisturiser with it. Rachel - Maybe too much for my sensitive skin? Well first I have to say that I have been a fan of Paula's reviews since her first Beauty Bible came out, and have followed her subsequent books, articles, etc. until now, and I am still doing it, as well as listening to her radio show. I have been a Beautypedia subscriber from before it was a webpage, and have been buying her products when there still wasn't a single Paula's Choice shop in Europe (I had them sent from their US online shop). Overall I have always been pretty satisfied wit most of Paula's products, with a few exceptions only, but some of them are still great for my skin and continue to order and use them, despite the recent size "shrinking" of some of them, and also higher prices for a couple of sunscreens, and honestly I must mention am not pleasantly surprised by the very recent change of size of one of my favourites, the lip balm, which is now half the product but the price remains the same. I think these little things are not consistent with Paula's admirable work and I cannot understand them so far nor do I approve of them as a loyal customer. I have had to stop buying the lipbalm and have fortunately found a very similar option at a reasonable price. Aside of all that, as for this product, the Resist moisturizer, I am sad to give it two stars only, (and in reality I should have given one because of my awful experience with it, but I understand from the ingredient list and the research evidence that this may be no doubt a great product for many lucky people). In short, I experienced a very immediate and exaggerated irritation all over my face shortly after having applied this product, I was so very much looking forward to trying it, and half an hour after application I had to rush to the nearest ER because my face was all red, swollen and covered in small red bumps. Obviously it seemed that I was allergic to some kind of ingredient. I had to have antihistaminic shots as well as had to take anti allergy medication for more than one week, until it finally went away and my skin looked normal again.I have now realized I have extremely sensitive skin, and honestly thought that simply my delicate skin couldn't take it, so to speak. However after this shocking experience I did go to my dermatologist to have the product ingredient list tested on me to find out what was causing me the allergy. Yes my doctor prepared a common but personalized allergy test with all the ingredients in the Resist moisturizer list and applied a drop of each one of them on my back, after slighly piercing on each spot, together with some other more common skin allergens (since I was going to bother to do this I might as well do it as thoroughly as possible), and had this as a very large patch stuck on my back for one week until the results came out. To my doctor and my own surprise, my skin did not reveal any sign of allergy or even slight irritation to any of Paula's Resist ingredients! As it turns out I found out my skin is sensitive and allergic to the metal nickel, which can be found in many common objects, including coins, some types of food, etc. So my doctor told me that reaction might have been because I might have touched something metallic containing nickel right before applying the moisturizer, which is rare in me since I am always very careful to have clean washed hands before applying both creams or cosmetics, but of course it is a possibility. Anyway, apologies for the long review, but I just think it might help some people, and I just wanted to share with Paula and her team my experience. The customer service was very fast to respond, I sent them the remainder of the product back and they quickly reimbursed me for the product and all the expenses. Great customer service. I am just still wondering if I should buy a sample and try to use it making sure this time my hands are absolutely clean right before I apply it, but I had such a bad time that I don't dare to do it and stick to my usual products. A shame! Customer Care: Thank you for your comments. We will share this information with Paula and her team in the US. This feels just right on my skin (combination) and leaves no oily residue, but despite only using it once a day, it only lasted two months. Paula's other products last much longer, so this was a disappointment because ordering her products from Europe is expensive. Yeast-derived ingredient that functions as a good soothing and skin-restoring agent. A natural component of human skin sebum (oil). It is a wonderfully moisturising ingredient as well as being a source of replenishing fatty acids and antioxidants. What is the difference between Resist Barrier Repair Moisturizer and Resist Intensive Repair Cream? The biggest difference between Resist Barrier Repair Moisturizer and Resist Intensive Repair Cream is the texture. Resist Barrier Repair Moisturizer has the texture of a light lotion that is best for normal, slightly dry skin. Resist Intensive Repair Cream has a richer, more creamy texture, which is ideal for dry or very dry skin. Both formulas contain an effective mix of ingredients to combat skin ageing, including retinol. So it depends on your preference and skin type which is most suitable for you. I keep depressing the pump, but no product is coming out. The pump is not broken as you might think, but it is a so called airless pump. This product is packaged in an airless pump dispenser which utilizes a vacuum system to dispense and keep the contents fresh. Airless packaging helps to keep air and contaminates out of the product, which enhances the formula's stability and effectiveness. When using your product for the first time, you may need to "prime" the dispenser. To prime, simply pump the dispenser slowly about 10-15 times. If the dispenser stops working at any time, simply repeat the "priming" step. Do not attempt to dismantle the package. We kindly request you to please try again. If the pump still isn’t working please contact us. 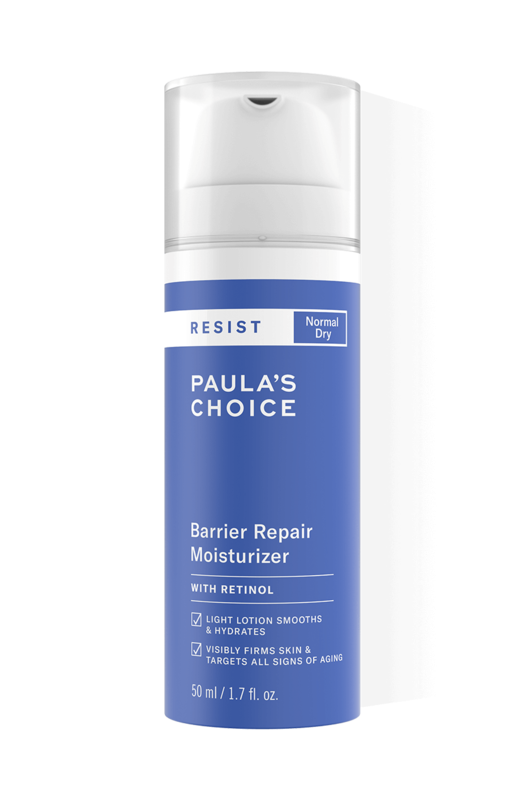 Is there another Paula's Choice product similar to the Resist Anti-Aging Moisturiser? Our Resist Anti-Aging Moisturiser is identical to our PC4Men Moisturiser. Creamy cleanser gently yet effectively removes dirt and makeup for clean, smooth skin. Hydrating exfoliant corrects uneven skin tone and minimises fine lines and wrinkles. Antioxidant serum with vitamin C works to firm, brighten and improve uneven skin tone. Protects skin from the sun and improves skin tone.